Highways England has announced a series of trials for variable speed limits at motorway roadworks. If successful, the scheme would allow drivers to travel at higher speeds when workers are offsite, such as weekends and evenings. This is not the first time the Government agency has toyed with roadwork speed limits; in 2017 it tested 60mph at a number of locations across the UK to see if it would reduce congestion and improve traffic flow. However, under new plans, it wants to see if varying speed limits could safely be operated within roadworks, without increasing the risks to either drivers or road workers. Locations for the trials are yet to be agreed, but once in place they will see the speed limit increased to 60mph when the roads are quiet - such as weekends - and then brought back down to 50mph during the week when the workers return. 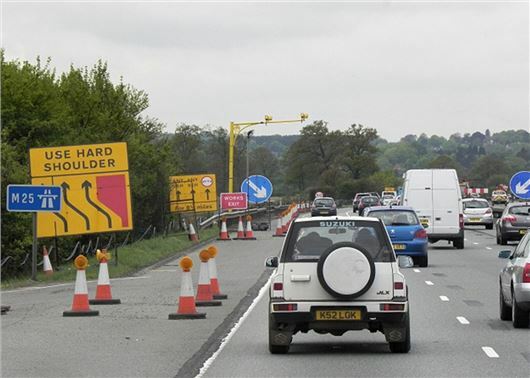 Highways England is also exploring if different speed limits could operate within the same set of roadworks. This could mean people travel on one carriageway at 50mph, as they are nearer the workforce, while drivers on the opposite side of the carriageway would get a 60mph limit as the road workers are further away. “People understand roadworks are necessary but are also frustrated by them. At the same time we have to ensure as they drive through them that they, and our road workers, are safe,” said Jim O’Sullivan, Chief Executive of Highways England. If given the go-ahead, the changes would be limited to motorways in England, with road transport in Scotland and Wales devolved to separate agencies. Exactly. Also, it should be 70 on the opposite carriageway too. Quite why the limit through the road works on the M5 by Birmingham is 30 day and night I can't see. It's not the problem of the 50 mph speed limit in roadworks being too slow, it's the vechicles in front doing 40 mph and others behind who are trying to be driven at 60 mph plus. Same as in a 40 mph limit road with some vehicles driven at speed then as soon as they are coming up to the camera slowing down to 20 mph! Why are there speedlimits anyway? I am allowed to drive at 60mph on a single carriageway road with no protection from the traffic traveling in the other direction, so 60mph in a contraflow is clearly safe as a driver. For the workers, any vehicle doing in excess of 30mph will kill them if they are hit, so any speedlimit in excess of that won't save anyone.... What Highways England need to do is organise their roadworks properly. Just because they are at some stage over the next 2 years going to be, say, putting in a section of so-called managed motorway over a stretch of 20+ miles does not mean that the entire stretch has to have a 50 limit on it for the entire period. You can only realistically work on about 2 miles at a time, so work on that, get it complete, then move on to the next 2 miles stretch!